Have you ever been accused of walking around with your head in a cloud? So, too, does your Tab S2 NOOK. Every registered user is automatically set up with unlimited storage back at the Barnes & Noble mother ship (also known as the cloud). All items you get from the NOOK Store are automatically maintained in an archive at Barnes & Noble as well as on your device. You can also remove an item from your NOOK, which takes away its file from your tablet but keeps the link between your device and the NOOK cloud so that you can someday bring it back to the tablet. A file that you remove from your NOOK leaves behind only an icon or picture of its cover to remind you; any time you want to get that reading material, you can restore it from the NOOK cloud. You must have an active Wi-Fi connection to the Internet to retrieve the file. You can fill the NOOK archive with as much B&N electronic material as you want; grab it with a tap. Why would you remove something from your NOOK to the archive or cloud? You want to clear some space in the built-in memory or microSD card. Your Tab S2 NOOK or other NOOK device is stolen or permanently deceased; sign in to the same account to restore all the files to a new device or app. You can archive any of these from the NOOK cloud: books, magazines, newspapers, or catalogs. You can also reinstall apps or videos you have purchased. The NOOK cloud is only for material that you get from the NOOK Store. You can’t place personal files or media from other sources. However, you can connect your NOOK to a computer and make a backup folder of your personal material on that device. Go to the NOOK library. Press and hold on the cover of the book. This sounds like the book will be deleted and gone forever, but that’s not the case. It’s removed from the hardware and kept in your archive even though it doesn’t say that exactly. You can get it back by going to the archive; just tap the Menu icon in your NOOK library. There’s a big difference between archiving and deleting. If you archive an item, you can get it back from the NOOK cloud. If you delete any item, you erase it from your NOOK and can’t get it without going back to the original source. After you buy a book from Barnes & Noble, you own the license to that title on up to six devices or apps registered to your account. 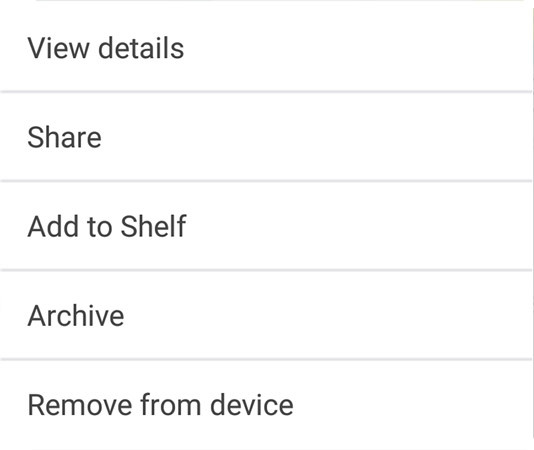 You can leave the book file on your Tab S2 NOOK or you can archive it back to your account, which removes it from the tablet but keeps it in your available material in the NOOK cloud. The key: All devices or applications must be registered to the same account.